when the moat on the right was filled in and the road widened to allow entry of the German emperor. Welcome to David Street just inside the Jaffa Gate of Jerusalem's Old City. Like today, it was a center for tourism over 100 years ago which explains the hotels, the signs in English, the sale of photographs, and a tourist office. No date is provided for the picture in the UCR files, but looking at another picture probably taken during the visit of Kaiser Wilhelm in 1898, this scene predates the visit. 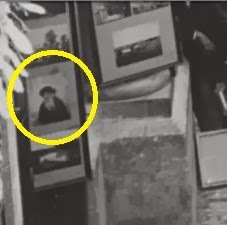 We found one of the photographs on sale of particular interest. (See the bottom left of the photo at the top.) We've seen that picture before -- in the Library of Congress collection. Photographs for sale in the 1890s. almost certainly taken in the 19th century, however. 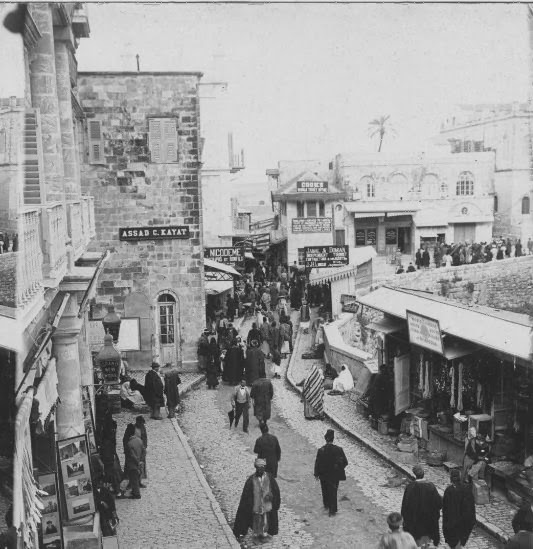 A sign on the street advertises "Bonfils," one of the leading photographers in the Near East at the end of the 19th century. 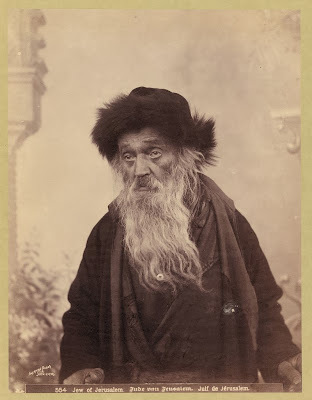 Many of his pictures appear in Israel Daily Picture. 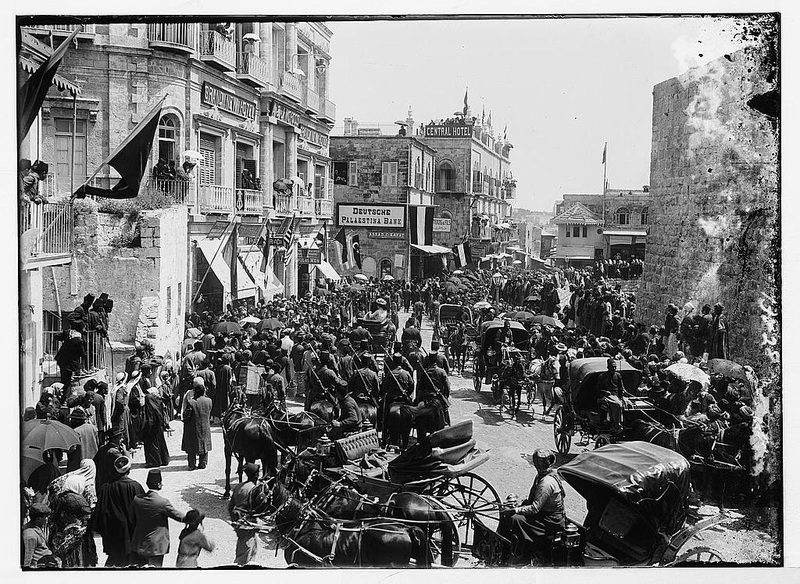 The Keystone collection photo from UCR also shows a prominent sign for the Cook's World Ticket Office, the leading travel agency for tourists and pilgrims to Palestine and Syria in the 19th century. The bottom sign offers guides and camp equipment. 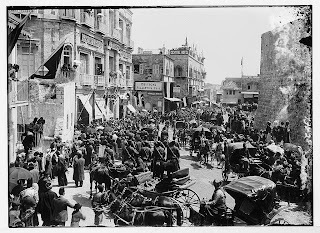 For more information on Cook's role in investment and development of tourism in Jerusalem and Jaffa, read Ruth Kark's From Pilgrimage to Budding Tourism: The role of Thomas Cook in the rediscovery of the Holy Land in the 19th Century. Strangely, Cook's signs cannot be seen in the photograph of the German emperor's arrival. Cook had supplied dozens of large tents for the emperor's entourage, but the signs were covered over. The name "Assad C. Kayat" appears on a sign in the UCR photo. Ruth Kark's book on Sephardi Entrepreneurs in Jerusalem shows a 1903 check from the Jewish banker, Jacob Valero, to Kayat, but we have not discovered his profession or why he hung a sign in the Old City. Regarding the identity of Assad C Kayat, I received this email from a Christian Arab friend who lives near the Old City, together with a picture of a fine grandfather clock. there is also a sign that says Assad Kayat . Thats very intresting because I have a clock at home a very old one that also carry the same name. I thought that might be also intresting for you to know because I heared the story of that christian palestinian guy from jerusalem that use to make clocks and own a clock shop but never noticed where. But the picture now explaines the place."